When it comes to beauty products, I think we all can agree that every single one makes a lot of (often unrealistic) claims. It's nearly impossible to find a piece of skincare or even makeup that isn't chock full of anti-aging, fine-line correcting, unicorn rainbow filled ingredients. Unfortunately, more often than not, I find that many products fail to live up to their claims (and how can they when they're basically promising you a new face?). Honestly, one of the reasons I started reading blogs (and subsequently started my own) was to be able to weed out the good from the bad. It might be hard to take a Vogue "review" of a product at face value, but when you see something raved about across the blogosphere you know it's gotta be some good stuff. 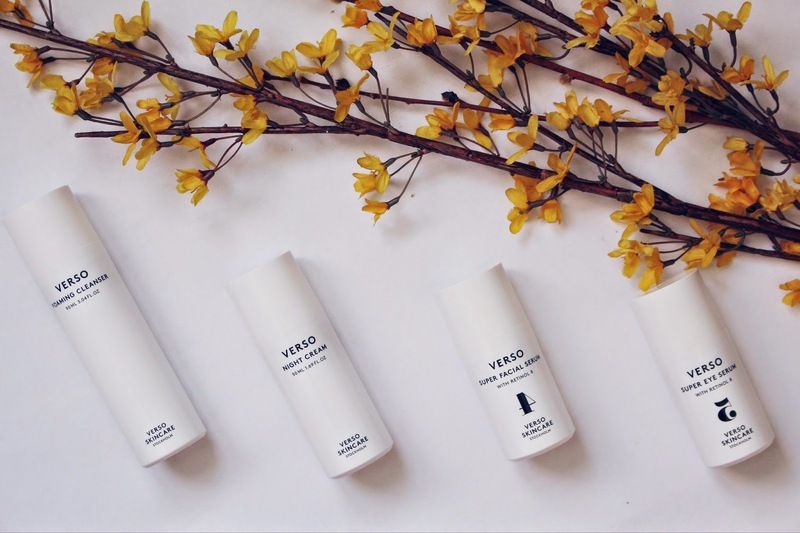 And it was through my research that I found, and fell in love, with Verso Skincare. Created by Lars Fredriksson, the entire Swedish line uses Retinol 8, a Vitamin A derivative that is proven to be far more effective and gentler than regular Retinol. For those that don't know, Retinol is an ingredient that has been proven "to smooth the appearance of wrinkles, strengthen the skin barrier, reduce pigmentation and supply the skin with more energy and oxygen" - so basically Retinol 8 is a much more jacked up version that's safe for even sensitive skin. Currently, the brand carries seven different products, all numbered (in gorgeous minimalist packaging, I must add) to make skincare application that much simpler. So what makes Verso so different from the norm? Well, honestly, I can safely tell you that this stuff truly works. Now, it's not going to change your skin overnight, but after about a month of using each of these products I have noticed a visible difference in the texture of my skin. It's clearer, smoother and far less irritable then it was just a month back, and it's still getting better with each day of use. At this point, I've written extensively about the Verso Super Eye Serum and how much it has changed my dark circles (cases in point here and here), so I figured it was about time to introduce you to a few more gems from the line. First up is #1 in the line, the Verso Foaming Cleanser. From the title, I did not think this would work for me at all. I have dry skin, so usually anything claiming to be "foaming" is a big no-no in my book. However I found this to be incredibly gentle, and it actually becomes an almost milky foam when combined with water, if that makes any sense at all. Once washed off it doesn't leave behind any awful residue behind, but instead leaves my skin feeling cleansed and hydrated. It also has helped clear up some acne in the time I've been using it, which is pretty awesome. All in all, while it's not the stand out of the line, I have really enjoyed the results enough to go out any buy a full size of this guy, something I can't say I've done after trying many cleanser samples. Next up is #3 in the line, the Verso Night Cream*. When I first picked up the Eye Serum from Space NK, the lovely associate gave me a small sample of the Night Cream to try and I instantly was hooked. With ingredients including Retinol 8, Tumeric Root and several different skin-loving oils, it's no wonder this is one of the brand's bestsellers. It not only gives amazing results from the Retinol 8-based formula but is also incredibly nourishing to the skin, providing it with antioxidants and plenty of hydrating properties. It's a fairly rich formula but never leaves your face feeling greasy or heavy - instead it dries down to an almost satin-y finish that leaves your skin absolutely glowing come morning. I've been using this every single night since I received it, applying it after #4 from the brand, their Verso Super Facial Serum. With the highest concentration of Retinol 8 from the line, the Super Facial Serum is really a bit of a boot camp for your face. This is the one product that I'd recommend easing yourself into slowly if you have sensitive skin, because it definitely is a strong one. For the first week of use, I found this guy actually purged my skin a bit, allowing any clogged pores I had to come to the surface. While at the time it wasn't fun, my skin is so much better for it now. It took that week for my skin to really get acclimated to the Serum, but now that it has I've found it to be insanely effective for evening out my skintone and texture. My current routine is to apply a combination of the Super Facial Serum with a drop or two of my Gressa Purifying Oil*, allowing it to dry before applying the Super Eye Serum and Night Cream on top. That's the routine I've been repeating nightly for the past several weeks and my skin has never felt better. And I truly credit Verso for that - it's one brand that really lives up to its promises.